In main vessel, add components of Phase A with gentle mixing. Begin heating to 70-75ºC. Add Phase B into Phase A with continued mixing and maintaining termperature of 70-75ºC. 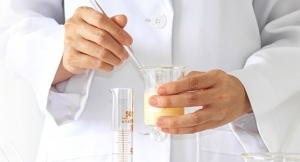 Add Phase C into Phase AB with continued mixing and maintaining temperature of 70-75ºC. When batch is uniform, begin cooling and add Phase D to batch. When batch is cooled to 45ºC, fill the pre-heated sticks. Place sticks in freezer for 12—24 hrs. before first use.